Wrong sound and text outputs of the Grand Vizier announcing the new monument. Attacking or destroying the overland trade units will trigger a wrong sound output. Building menu: activating the second overview will only display buildings unlocked at current stage of the game (other than in the first view which greys out buildings not yet available). Building menu: Buildings displayed in the second overview cannot be copied with the pipette. Sea water saline: Setting the salt fields automatically gives non-functional results. All new contents can be used only with the Addon. Obelisk eingefügt, als Zierobjekt und als Variante für den Gebetsplatz. Pyramiden eingefügt, als Zierobjekt und als Variante für die Moschee. Wasserturm eingefügt, als Zierobjekt und als Variante für die Noria. Fruchtbarkeitsförderung im Norden durch Noria wieder aktiviert. Asian building are no longer unlocked with the other buildings, since it caused problems with the AI. AI got militarized again, and its abilities to build cities is improved. The gigantic maps caused processing power problems for some people and were removed. Corsair buildings are available via the achievements. Asian buildings are available together with the regular ones. Buying and selling prices for ships are higher. Bug fix: Building costs of ships. Graphic files were saved anew, should probably lessen memory usage. Caution: not tested. New and changed scenario islands available. If the mapsize is set to "huge", either huge or gigantic maps are generated randomly. Attention: Gigantic maps need very much computing capacity. Corrected description for the potato farm. ALLE neuen Inhalte nur mit Addon nutzbar. Development stage 1 & 2 with snow covered roofs for winter islands. Asian civilization available at development stage 1. Venetian market booths available for land and water. Tavern and many other buildings have several alternative models. Water canals without reeds, with an additioanl transition to rivers. Fisherman and salt garden revised. Flour as a requirement for the Orient. Alteration of the Corsair... wait and see. Disasters strike more often and ore devastatingly. Buying the council is more expensive. New scenarios included (original scenarios are replaced). And many things more to get surprised. 4 new views (keyboard only). Unlocking Venetian buildings now easier. Venetian buildings now cost less honour points. Added quay wall to align with coastline for occident. Added some new special items. Added jugglers' wagon (produces Honour). Pillory and tower satisfy need for security. Altered farms for sheep, pigs, cattle and goats. Added education and recreation as needs. Added new needs for goods in the Orient. Added Assassin's Fortress, produces military units. Added Academy, satisfies need for education. Added Carpenter's House and Fire Station (as one building) for the Orient. Added Prayer Square, satisfies need for faith. Added Venetian buildings, construction of whole cities on land and water now enabled. Square can now be built across streets. Added donkey and camel caravans. Added edge fillers to enable construction of diagonal roads. Added Aneth Farm which is necessary to complete quests/missions involving spices on the Citizen and Patrician levels. Added soldiers as decorative objects. Original hedgerow is now a construction set. Added "small catastrophes" and random events. Only Addon: New coats-of-arms for player profile. New items for drapery, potato liquor, clay and market square. Special decorative object after reaching 10,000 noblemen changed to 8,000 noblemen. Small and medium market square (Orient and Occident) now have additional foundation ground. Only Addon: Restored proper water storage capacity for Norias. Northern quay wall adjusted to align with roads. Small and medium market square (Orient and Occident) statisfy need for community. People now move properly across Venetian bridges. 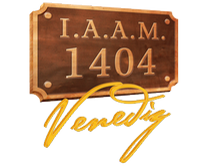 Editors work properly - I.A.A.M.1404 EditorTools required. Foundation grounds of Venetian Warehouse adjusted. Added colour variant to Cathedral. Amended building menu, button to swap to second overview shifted and enlarged. Oriental pier now has proper quay wall foundation. Maintenance costs for small and medium tradeships adjusted. Oriental repair crane doesn't disappear any more (wooden beam had be removed). Good "Salt" shifted to Peasants in the Warehouse. Awarded ships are now the right ones. 45 deg wooden landing stage: all four views now same size, reduced to one variant. Salt Garden now extends further into water and receives concrete foundation when linked to quay wall. Note: Older Salt Gardens in your savegames will not have these new features but still function all right. You can remove them and build new ones but you don't have to. AI now have the right coat of arms. Influence area of watchhouse slightly extended. Amended building menu because of more need for space. Three new goods: Drapery, potato liquor, pottery. Imperial Cathedral now only satisfies need for faith. Two new shipyards: Medium Shipyard and Special Shipyard. Amended ships. For the Occident: Small, medium and large trading ship as well as small, medium and large warship. Flagship, Corsair's ship and an inconspicuous tradeship. Everything else remained the same as before. There are four market houses and five warehouses in the Occident now. The Orient has one additional warehouse. These new warehouses can always be built. Five new storehouses in the North and two in the South. Only Addon: Manor and Residence...same function as the original steward's office. Varius decorative squares to be placed one by one. Land-based quay wall to fill edges. Edge filler... turn round to square. Farm fields changed in three variants. Fisherman's hut with quay wall and a habour ropeyard. Special decorative object after reaching 10,000 noblemen. Weapons and cannons production unlocked earlier due to shipbuilding amendments. Only Addon: Item sale by Lord Northburgh amended: Prestige items for the Vizier only socketed in Peasant faction due to "prestige bug". Various decorative objects increase satisfaction and tax income. Fourth monument, increases visibility range of ships. Norias now hold substantially more water. Decorative elements which could be bought are now for free and available immediately. New coats-of-arms for player profile. Various sounds when buildings are built. Land-based trade is now possible. Only Addon: Added Venetian Warehouse and Venetian quay wall to construction set. If I have forgotten something.... sorry!